Located 49km north of Qinhuangdao City, the Dongjiakou section of the Great Wall runs across high ridges and mountains, its highest point reaching 556 meters above sea level. Along this 8.9 km section, at strategic spits 36 watchtowers, 28 protruding platforms, 16 beacon towers and three fortress towns were built. These military structures are well preserved, except for the three fortress towns of Dongjakou, Damaoshan, and Chengziyu, which were built during the Ming period (1368-1644) to quarter garrison troops. Today they have developed into villages-Dongjiakou village at the center, Damaoshan village one km to the east, and Chengziyu village two km to the west. The villagers of Dongjiakou are the descendants of the builders and guards of the Great Wall. Therefore, the villagers have taken it upon themselves to maintain this section of the Wall as original as possible. Due to lack of personal money, they have been able to restore only a small section, but have done a remarkable job none-the-less. Old bricks were collected and re-deployed to repair broken sections. It is interesting to note that a local villager, Mr. Sun, has taken it upon himself to make a voluntary daily inspection of the Wall to ensure its safety. 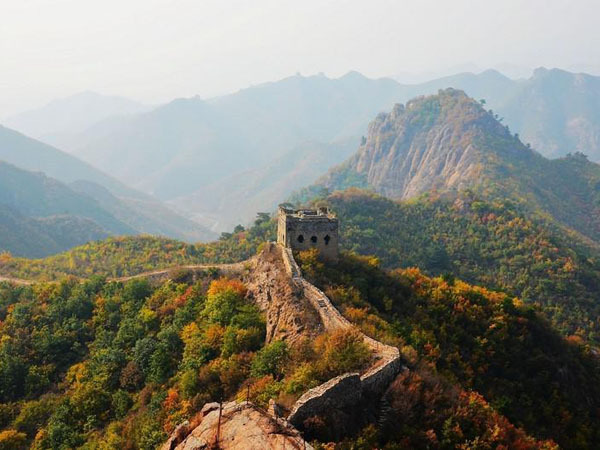 The section of the Great Wall north of Damaoshan village has been opened to the public. It has six watchtowers; among them the one called Jianlou (Arrow Tower) with 24 embrasures in the walls was built on the top of a 100 meter-high peak. The stone arch above the first gate of the first watchtower in the east is carved with two lions playing with a silk ball, a typical stone carving of the Ming Dynasty. On the top of the Great Wall from the foot of the mountain to Sunjia Tower-the second watchtower in the west-embrasured barrier walls were built, vertically attached to the battlements. These barrier walls functioned as shields for the guards when they were shooting arrows through the embrasures at enemies who had already climbed to the top of the wall. On the top of Sunjia Tower there are four drum-shaped stone plinths, which supported the wooden columns of the soldiers’ living quarters. The third watchtower in the west has a stone arch engraved with the characters zhongyi and baoguo, meaning “serve the country with loyalty and righteousness”. The tower has a winding corridor and a caisson ceiling. On the fifth watchtower in the west there is an arched doorway in the outer wall, allowing the garrison to make sallies against the enemy. This is not found in other watchtowers in the section. The sixth watchtower in the west is remarkably narrower than ordinary ones, and has gates opening to the north and south. In its north wall there are five embrasures, and in the south wall, six, which is rare, and thus the tower was also called “Six-Eye Tower”. To the north of the watchtower stands a surveyors’ beacon marking an altitude of 462.1 meters. Kulou (Stonehouse Tower) located on an old riverbed north of Chengziyu, served as a major arsenal during the Ming Dynasty. A large number of weapons were found here, including metal arrowheads, stone grenades, gunpowder, iron cannons, and brass harquebuses. Among these, the most valuable are three brass harquebuses together with 24 shells manufactured during the Jiaqing reign period (1522-1566) of the Ming Dynasty. They are in the collections of the Military Museum of the Chinese People’s Revolution and of Funing County. At Zouliuhe village, three km from Dongjiakou, stands the Guandi Temple, dedicated to Guan Yu, a general who was deified as the god of war as well as the patron guardian of business. Though not big in scale, it has couplets and murals of a high level of artistry, recounting stories about Guan Yu, his virtues, and merits.